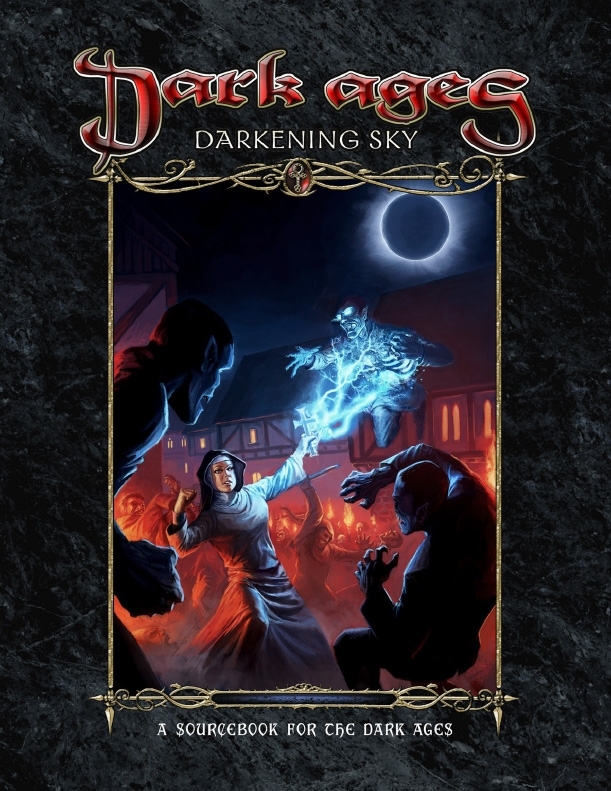 Dark Ages: Darkening Sky is now available in print via DriveThruRPG! Darkening Sky is a series of five stories for the Dark Ages game lines. You’ll find a story forFae©, Inquisitor©, Mage©, Vampire©, and Werewolf© inside, each with a unique twist on the 1230 eclipse. Will there be a coupon for those who bought the PDF already? Or was there already a coupon, and I (again) didn’t get it? Unfortunately, nobody answered so far. Not here, not in the forums. I mailed Rich, the coupons went out, when the PoD went online. I checked my trash and all eMails of that day, the day before and after. So, I did ask DriveThru and they checked, that I had ordered the PDF before PoD was online and resent me the coupon (well, sent me a link, that added a Darkening Sky with lower cost to my cart). So, if anyone else misses the coupon, I suggest to ask the DriveThru support, too.